Around here, we like it fresh, especially when it comes to freshly-caught fish—just like the salmon of Capistrano! Wait, no. That can’t be right. I’m confusing Dumb & Dumber quotes with reality again. Though, some of the best salmon on the planet has been in season, so it’s the perfect occasion for a fish dish. The school calendar may say summer’s over, but the warm weather is hanging around. I enjoy fresh seafood, especially if it’s wild-caught. Besides halibut, one of my favorite types of seafood is salmon—healthy, hearty—and should it be Sockeye, even better! Recently, my local market offered wild sockeye for a hot minute, so I grabbed some fresh fillets for dinner. I usually grill with a little citrus & herb marinade, but I decided to try a crust idea I’ve had in mind. This time I chose roasted almonds & bread crumbs, serving the fish with a light herb & lemon quinoa (since that’s one grain I’ve been neglecting). Nothing beats fresh, wild sockeye salmon, except when we almond crust it! Pair it with some lemon & herb quinoa, and we have a great summer meal. Rinse dry quinoa with cold water in a fine mesh strainer. In a medium saucepan combine quinoa, chicken stock, lemon juice, white wine, stir & bring to a boil over medium heat. Reduce heat to a simmer, cover pot with lid, and cook quinoa for ~15 mins, remove from heat. Fluff grains with fork, set aside (You will need to warm before serving). In a food processor, grind almonds into a uniform fine crumb mix. In a large mixing bowl, combine honey almond crumbs, panko crumbs, minced garlic, parsley, salt, pepper & the EVOO, combining with a fork. Layout salmon fillets on board or wax paper & check for bones (usually a ridge along collar), using cooking tweezers to remove any. Smear flesh side of salmon with a little mayo, (a thin even layer to coat entire top). Press generous layer of nut crust mix down onto the top of salmon (coated with mayo), so it sticks to top of fillets. Bake in a 325 degree, pre-heated oven on foil lined pan (with crust side up, skin side down). Bake until crust toasts & browns somewhat, and pink flesh of salmon is flakey when tested with fork (mine took ~8 mins). Remove from oven & cool on pan or rack (bottom skin should peel off easily, discard skin). While salmon’s in oven, in a skillet on stove, make the lemon herb butter sauce by melting butter with the ingredients, then pour ¾ of butter sauce into a separate bowl to set aside, reserving remainder in skillet. To skillet add the fresh spinach leaves, and stir to coat in remaining bit of butter, heat spinach for a few minutes on low until wilted, remove from heat, set aside. Reheat quinoa on low in pan, adding a teaspoon of the melted herb butter sauce, stir to combine. Serve dish by first plating a serving of warm quinoa, then top with some sautéed spinach, and a serving of fish, drizzle additional lemon herb butter on top of fish, as desired. Remove fresh salmon fillets from refrigerator ~15-20 mins before cooking. If your fillets have the skin still on bottom, it is easily removed after cooking in pan. My filets had some thin bones in the collar, so this took a little prep to tweeze them out. Aside from deboning, this one bakes quickly. Alas, the meal turned out swimmingly! (Well, maybe not from the salmon’s perspective.) 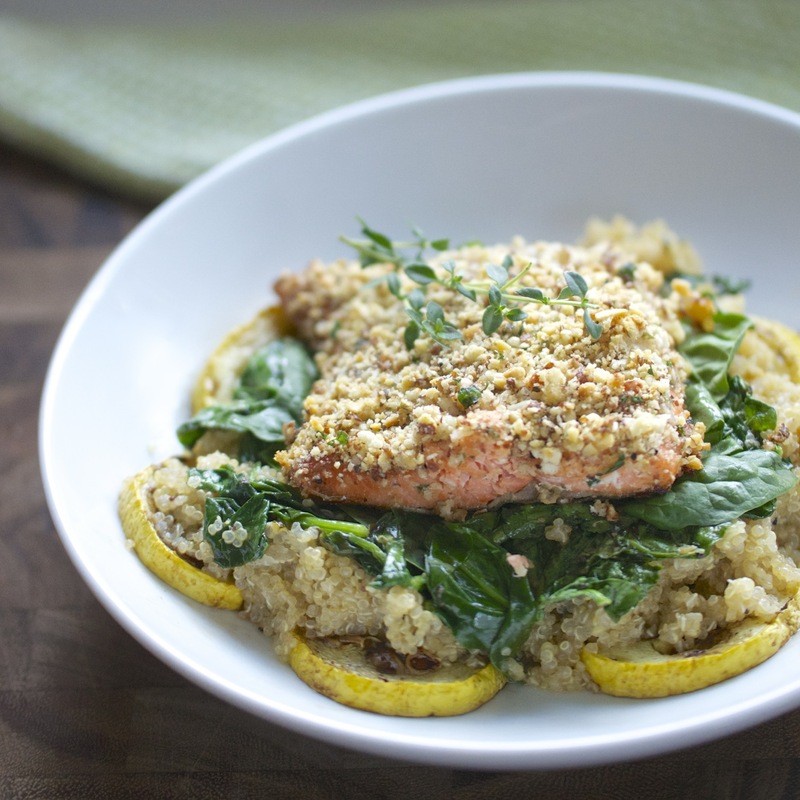 Our golden crust was the perfect compliment for the flakey texture, and the herb-lemon butter worked wonders with both the salmon & quinoa. As for some veggies, I love to incorporate fresh spinach when possible, so I tossed some into a little of our sauce. I also added yellow squash I had, simply cooking stovetop with some balsamic. We ended up with a layered dish of healthy components & vibrant flavors, pleasing to thy palate! This simple crust isn’t reserved solely for salmon, but for other fish you may fancy. You can substitute the almonds for cashews or macadamia nuts for a different flavor profile, though I liked the crunch the honey almonds lent. If you’re staying away from gluten, you could easily skip the bread crumbs—just add more of the ground nuts. Next time, I plan to change things-up, serving this over jasmine rice or parmesan risotto. Too many tasty variations, too little time. . . . If you come across fresh Sockeye salmon, grab some while there’s still time!